EARTH DAY SNACK IDEAS FOR KIDS & ADULTS ALIKE! Perfect for a sun-filled day at the park or in the garden, you will feel AWESOME (!) with these delicious grab-and-go Earth Day snack and smoothie recipes. Helps balance your gut flora. Helpful for lactose intolerant people. Most importantly, it tastes AMAZING! 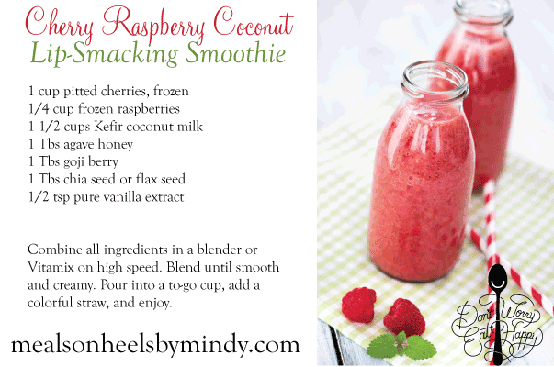 Coconut kefir wonderfully blends with cherries and raspberries to add a tart taste to this irresistible smoothie snack. YUM! Combine all ingredients in a blender or Vitamix on high speed. Blend until smooth and creamy. Pour into a to-go cup, add a colorful straw, and enjoy.